Vigorous, medium early and productive hybrid. Fruit is oblong-shaped and weighing 9-12 kg. Rind is light green with dark green strips. It has good shipping ability. Flesh is red, tender and juicy. Fruits can be harvested within 80-85 days from sowing. Recommended to prune the first fruit. 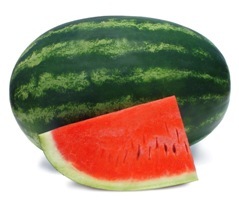 Requires enough water & potash during fruit developement stage to avoid mis-shaping.